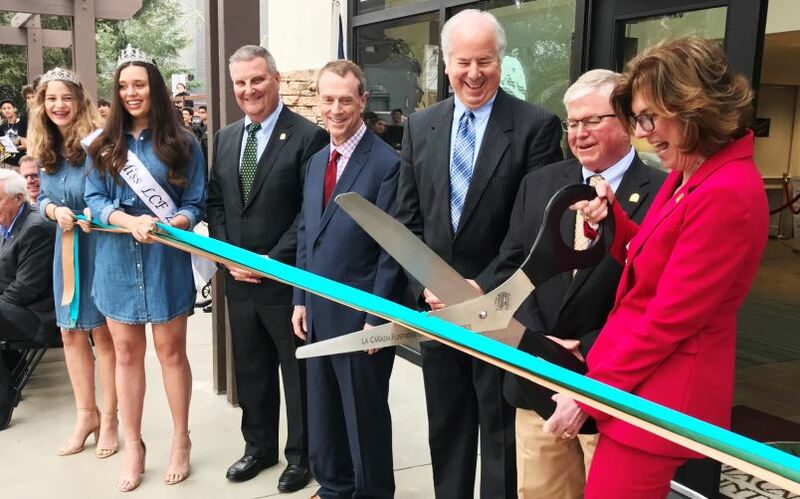 Miss La Cañada Flintridge Royal Court member Kat Hightower, Miss LCF Francesca Christensen, LCF councilmen Michael Davitt, Jon Curtis, Greg Brown and Leonard Pieroni, and LCF Mayor Terry Walker help cut the ribbon to officially open the new City Hall at One Civic Center Drive. La Cañada Flintridge came together in style on Tuesday to officially open and celebrate its new City Hall with tours, speeches, snacks and a ribbon cutting, followed with the first City Council meeting at the new site. Mayor Terry Walker welcomed everyone in front of the newly remodeled two-story building with multiple conference rooms at One Civic Center Drive. The event drew more than 100 people. Walker said the new City Hall is an important move and she is proud of being centrally located. Officials presented a dedication plaque and performed a ribbon cutting ceremony alongside Chamber of Commerce CEO Pat Anderson. The chamber plans to move into its new headquarters at the site next month. Tours were given to show off the downstairs Council Chambers and departments upstairs, including planning, public works and a large office adorned with USC memorabilia, belonging to City Manager Mark Alexander, who graduated from the institution with a master’s degree in public administration. Alexander said he went back to the old City Hall on March 1 after everything had been cleared out. Members of the tour were excited about the new building and what it means for the community. Mary Gant, an ambassador for the LCF Chamber of Commerce and a La Cañada Kiwanis club member, said the new city hall is a fantastic improvement. La Cañada Flintridge councilmen (from left) Jonathan Curtis and Leonard Pieroni, Mayor Terry Walker and councilmen Michael Davitt and Greg Brown kick off the first City Council meeting inside the new City Hall chambers on Tuesday. “I think it’s very exciting and I think it’s something the city has needed and it will really be a showcase for the city,” she said. The former City Hall at 1327 Foothill Boulevard, less than a mile from the new building, was in use for more than 40 years. Knight Insurance purchased that site and will remodel the interior before it officially opens for business there, officials have said. The purchase/sale agreement stipulated a purchase price of $3.3 million with a $250,000 deposit into escrow, which closed on March 4, Alexander said. The new City Hall location was purchased for $11.23 million in a transaction that included the former Sports Chalet headquarters and the adjoining Montessori school property in February 2017. With renovations, begun in July 2018, the purchase and total initial project cost has been estimated at $18.3 million. During a tour of the new City Hall, Lisa Brancheau, a senior management analyst for LCF, pointed out that more than 100 boxes of records have been stored properly in the basement of the new building, in a locked room near where employees park. After the tour and the closing comments, a reception was held with refreshments in the new David A. Spence Memorial Community Room. The room is dedicated to six-time former Mayor Spence, who died unexpectedly on May 16, 2017. In March of that year, he had been re-elected to a seventh term.